There are so many families in American with at least one pet. And when you decide to go on vacation it’s a big decision. Do you take your pet with you or leave them behind? If you’re thinking about traveling with your dog, how do you do it? Your dog is a loving, loyal member of the family and most people choose to travel with their dog. Traveling with a canine can be a smooth, stress free experience if you know what to expect up front and can avoid any pitfalls. Here are the main things to remember. Depending on the method of transportation that you’re using, the steps that you need to take will vary. Here, we’re going to take a look at traveling with your dog in a vehicle, plane and ship. If you plan on traveling with your dog in a car or truck, you need to be aware that dogs should not be allowed to have access to move around the vehicle. The reason for this is because it’s too easy to take your eyes off the road and get involved in an accident if your furry family member nudges your arm or suddenly leaps toward you. Previously, I put one of my dogs in the car unrestrained and he leaped from the back seat to the front while I was driving. Not only that, but after I yelled at him (in shock), he then proceeded to lick my face while I’m still trying to concentrate on driving a high speed road with lots of traffic. I never risked that again! When traveling with your dog in a vehicle, for his safety and yours, your dog needs to be restrained. Dogs can sit comfortably in specially designed seat belts or harnesses. To see the pros and cons of different types of dog seat belts, click here for more detail and pictures. There are dog seat belts to suit every size and breed of dog. Some pet owners prefer to keep their dogs crated as they travel. If you prefer to use a crate or carrier when traveling with your dog, then whatever he’s secured in should be in a seat belt so that it doesn’t slide around. Click Here to see more details on this foldable dog travel crate. You can place a seat belt through the carry handles to secure it in a car. Which dogs are suited to a crate for travel? A dog travel crate can be good for a dog that is happy to sleep while driving in the car. But if your dog suffers from travel sickness, a crate won’t be good for him. If you’re traveling with your dog a long distance you’ll need to consider whether travel sickness is a problem. Dogs that get travel sickness need to be able to see out the window to help them feel better. It can also help to slightly open the window, just a crack, to give your dog a blast of fresh air. And this also helps them to feel better. Just be careful not to open the window wide enough that your dog could jump out. Another thing to consider when you’re traveling with your dog is…don’t allow your dog to ride in the front passenger seat. In the event of an accident, with the force of the air bag deploying, it could seriously harm and even be fatal for your dog. Remember that your dog will need to stop to stretch his legs as well as answer nature’s call. Some pet owners take this time to feed their dog, but remember if you do feed him, he’s going to need to go to the bathroom again soon. It’s best to stop often when you’re traveling with a dog (see more on this below). There are lots of items to pack for your dog. If you’re traveling with your dog in a vehicle, you may want to use a dog travel supply checklist. When you’re traveling with your dog in a vehicle you’ll need to be stopping frequently. This means you need to have plenty of doggy waste bags to pick up poop. You don’t want to be caught trying to find a store to purchase them when you’re in an unfamiliar area. And you don’t want to be stuck having to use an inferior thin plastic bag that is likely to leak. Get the right quality dog poop bags and be happy knowing you’re prepared. You’ll also need to take plenty of water with you when you’re traveling with your dog. You can’t always be assured of being able to access clean water easily. Take bottles of water safely secured in your car so they’re not a hazard to anyone inside the car if you need to stop suddenly. Bottles of water are heavy and they become a missile hazard if they’re not secured. Click Here to see the price on these food-grade silicone collapsible dog bowls. It’s one thing to have the water with you, it’s another thing to have a suitable drinking bowl for your pet. Take at least two dog bowls on your trip. You can choose a collapsible silicone type of dog bowl or a folding doggy drink bottle. Whatever you choose, make sure your dog is familiar with it and comfortable using it before you embark on your trip. If you’re buying a new dog bowl, you’ll also want to give it a good wash before letting your dog use it. This is in case there are any plastic smells or manufacturing residues on the new product. Dog food is essential, obviously. However, as already mentioned, you may want to limit the amount of food you give your dog on the trip. This is because he’ll need to go to the bathroom and also it could make your dog feel unwell to eat a lot while traveling. It’s best to give you dog a good meal once you arrive at your destination. Remember to take treats too when you’re traveling with your dog. If you make homemade dog treats and it’s summertime, it’s a good idea to freeze some of them ahead of time. While you’re in the car the treats will thaw and be fresh and ready for your faithful friend throughout the day of travel when you stop for a break. Pet pee pads are essential if your dog is not fully potty trained. If your dog is young or older and incontinent, you’ll need to take dog pee pads with you. This is really important if you’re traveling with your dog in the car because they may behave differently in the car than at home. They may not give you warning they need to answer the call of nature. Pack enough to use in the car and at your destination. Pack as many as you’ll need to be prepared. And if you’re using dog diapers for your pet, remember to pack enough for the trip. Dog diapers can be really useful on a long car trip if your dog is not potty trained. This can save you from a messy clean up at the end of your drive. Dog diapers come in different sizes and are available for male or female dogs. Just be sure to follow the instructions on the size chart to get the correct fit for your dog. If you click on the image above for dog diapers be sure to watch the video to see how to correctly measure your dog for a leak-free fit. Favorite toys are essential on a vacation. Be sure to pack at least 2 or 3 doggy toys. It is tempting to pack more and I know it gets difficult to know where to draw the line, but try to limit your dog toys otherwise you won’t fit everything in the car! A familiar blanket is another essential to pack if you’re traveling with your dog. It will give them comfort in a new and unfamiliar environment. When it comes to dog beds there is a lot to consider. If you have a small dog it is usually easy to take your dog’s favorite dog bed with you in your car or truck. However, if you have a large dog with a large bed this may be impossible. There are plenty of travel dog beds available that are suited to traveling or camping (click here to see an article on traveling dog beds). Some roll up for stowing, some have a waterproof base to place on dewy grass, and others are the correct size to fit the back of your car. It is wise to buy a travel dog bed that can roll up or fold in half rather than getting stressed out when you can’t fit everything in your car. Be sure to buy the bed sooner rather than later and get your dog familiar with it before the trip. Once your dog has done one trip, he’ll be excited in the future to see the travel dog bed come out again because he’ll know you’re going on vacation together again! Some dog parents like to exercise their dog excessively the day before the road trip to get the energy out and help their dog settle during the car trip. Personally, my dog has high energy and I find it’s better to give him plenty of exercise on the morning of the road trip. But this can be really difficult. If you’re the one who has to pack the car, turn off the house appliances, check and double check that everything is ready to go then you really don’t have time to be taking your dog for a walk. And you’ll be exhausted by the time you need to drive. If possible, get your family or a neighbor to help. Is there someone else traveling with you? Can your spouse or one of the kids take the dog for a long walk? Does your mom live nearby? Can she see you off on your trip and take your faithful friend for a walk while you’re packing the car? Is there a dog loving neighbor in your street? Try your best to get some exercise for your dog. We all know our own dogs best. So, if you think it will work to give your dog lots of exercise the day before you’re traveling, then this is an easier option. When you’re traveling with your dog in a car you need to stop frequently. Don’t just let your dog out to relieve himself. He needs more time. He’ll need to stretch his legs. Give your dog a chance to run around and sniff out things. Giving your dog some exercise will help him to be more settled once he’s back in your car or truck. If you find a safe place to throw a ball this is a great way to get some exercise. Of course, if you’re near a busy road don’t let your dog off the leash for safety reasons. You can also use the opportunity to take your dog for a walk in a new town or other location. This is a good way for you to stretch your legs at the same time as your dog. It also lets you discover new places while on vacation. Factor in enough time to do this on your trip. Once you arrive at your destination you want to complete the positive experience for your dog. Make sure you give him a good meal, bring out a familiar toy and get his own dog bed or blanket out and placed in a suitable location. This will make him realize that everything is okay. You’ll also want to make sure that at first, you only introduce him to dogs you know will be friendly. The last thing you want to do is place your dog in a hostile environment after all that time in the car. 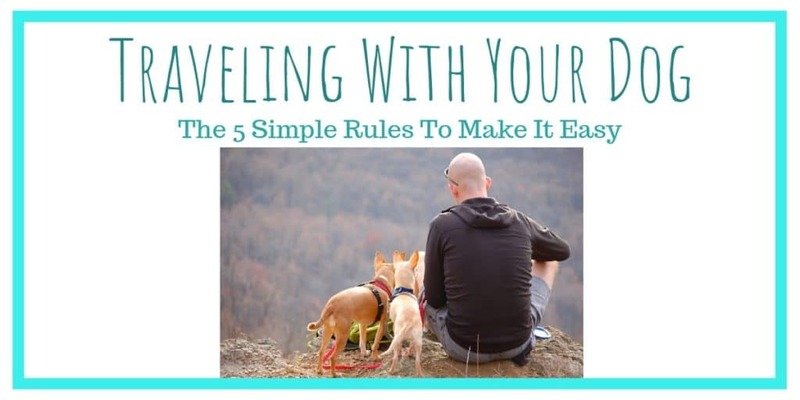 This is important because when you’re traveling with your dog, you want your dog to remember that the trip is fun and he’ll want to do it again next time. You certainly don’t want to make your dog hesitant about getting in the car. Provide your dog with re-assurance and make it a positive experience. If you plan to take a trip and want to get there by airplane along with your dog, make sure you allow some extra time and make sure you understand the hazards involved in flying with pets. Because the oxygen level is diminished, certain types of dogs are more likely to suffer problems. You’ll need to check with your airline to see if any dog breeds are excluded by them from air travel. Apart from respiratory problems, some dogs may also be excluded on the basis of safety to passengers. This is why you need to contact your airline and find out exactly what they allow. Most airlines have a restriction on the number of pets allowed on each flight. This means you need to contact them ahead of time and let them know you’re flying with your dog. They can tell you what their requirements are for booking. This is so important because we all know what it’s like to be delayed at an airport. If you need to wait for a later flight this will be more disturbing for your dog than it will be for you. Your dog will need to be kept in a dog crate in the airport and on the plane so it makes it a long time if you’re delayed by the flight being overbooked for pets. Click Here to see more details and the current price on this Airline Approved Pet Carrier (check dimensions with your airline). Many airlines welcome passengers traveling with dogs and you need to check the in-cabin policy of the airline if you want your dog to stay with you during the flight. This is the preferred way, if you’re traveling with your dog. But the decision may be made for you since only small dogs can travel in the cabin. See your airline’s size and weight restrictions for in-cabin pet traveling. Remember that the weight they quote usually has to include the weight of the dog crate or carrier your pet will be traveling in. There will be an additional fee and the dog will have to remain in a pet crate or carrier for the entire length of the flight. Most airlines will only allow passengers to travel in-cabin with one dog. Although they may have a policy where you can have a second dog travel but only if you pay for a full extra seat. If your dog is larger than the in-cabin size restrictions he’ll need to travel in the cargo hold. This is not as bad as it sounds. The pets are placed in an area that is pressurized the same as the area where you’ll be sitting. As long as you ensure your dog is comfortable in his crate, most dogs sleep through the flight. You’ll need proof of immunizations to show the airline. If you’re traveling overseas you’ll usually need to get extra vaccinations. It’s important to get these before you travel, otherwise on arrival you risk your dog being quarantined for days, weeks or even months without the correct vaccinations. If you are visiting an island location like Hawaii, the United Kingdom or Australia the requirements are usually more strict because they’re naturally able to keep certain animal diseases out of their physical location. For example, you would only want to take your dog to Australia if you are relocating there. Don’t consider taking your dog to Australia for vacation. Firstly, the plane trip is very long. And secondly, it is mandatory that your dog stay in quarantine for a minimum of 10 days (and it could be 30 days) even if all vaccinations are in place. This can cost around $2,000 for the quarantine stay. The reason Australia is so strict is because they do not have rabies or a number of other diseases in their country and they’re trying to keep it that way. Every overseas or island location has different requirements and different paperwork. For overseas travel your dog will also be required to have a pet passport. If you’re traveling to a new location it’s a good idea to find out where your dog is allowed to go. Are you going to a national park? Certain national parks and wilderness areas restrict where dogs are allowed to go. You may be allowed to take your dog to a campsite but they may be banned from certain trails or wilderness areas. If you know where you want to visit, don’t be disappointed when you’re on vacation and you find out your dog is not allowed there. Find out in advance because it’s going to be hard to get a dog-sitter on vacation, especially if you’re at a campsite! If your vacation involves visiting a lot of museums or art galleries then you’ll want to stay in a hotel in a city which not only allows dogs in the rooms, but also offers dog-sitting and dog walking services. These do exist so it’s worth getting the right accommodation. Most dog-friendly hotels will not let you leave your dog alone in the hotel room. If you’re worried about your dog traveling in the cargo hold of the plane plan ahead. You’ll need to make sure you familiarize your dog with his crate. The crate will need to be one which complies with the airline regulations. You’ll need to check ahead on the requirements for your specific airline. This dog water bowl can be used in a plane or vehicle without water splashing. It holds 3 quarts of water. Click Here to see more details and the price. Get the crate ahead of time and place it in your living room and let your dog discover it in familiar surroundings. If your dog can sniff it, walk into it and sit in it, he’ll start to like it. Also place a favorite blanket or toy in it. You’ll need to make sure your dog has access to water during the flight. And don’t restrict your dog’s water intake before the flight. You want your dog well-hydrated for flying. Find out what the airline recommends for a water bowl or bottle attached to the crate. This water bowl shown above is suitable for flying because it won’t splash. It holds 3 quarts of water and provides easy access for your dog to drink. Now here’s the stinkiest but most important tip. To make your dog feel secure when you’re not there, include some of your dirty laundry in the crate. You can use an unwashed t-shirt but if you do, make sure it’s not you’re favorite. Your dog may take to nesting before he lies down and claw at it in the crate causing it to tear. You can also use some dirty socks you’ve worn. As I said, this is a stinky tip but your dog will love you for it. If you plan to travel by ship, your dog can come along, depending on which cruise line you’re using. If you’re traveling with your dog and you plan on snuggling up to your pet in your cabin, think again. While there are some cruise lines that will allow you to take your dog with you, they usually aren’t allowed in the cabins. For example, Cunard’s Queen Mary 2 will let you bring your dog on certain cruises but you’ll need to keep him in the kennels on the ship. The staff will play with your dog, feed and exercise him on board. They will also clean up after him. You can visit your dog while on board during certain hours but you can’t take your dog out of the pet area. Other cruises have similar requirements but they may allow you to take your dog on deck in a dog stroller. Check with the cruise line. There are pet friendly cruise lines that will gladly accommodate your dog. But if you have a large dog, cruising may not be suitable. Cruising is obviously limited in the amount of space on a ship. You don’t have access to large parks for your dog to run. While dogs will be exercised in a pet area on board, this is never a large space. Traveling with your dog needs to be a positive experience for you and your dog so make sure he’s suited to the type of travel. It’s not only large dogs that need lots of space. If you have a high energy breed then your dog may not be able to get enough exercise on board a ship. This is unfair to your dog and it won’t make you happy either when you see your dog unhappy. Similar to flying, you’ll need to contact your cruise line well ahead of time. This means possibly 12-18 months ahead of your vacation. Find out their requirements and make sure you’ve got a proper booking for your dog to accompany you. Some cruises will only take about a dozen pets on board and these places get booked up quickly. If you’re on a transatlantic crossing you’ll need to find out the requirements for your dog to enter the UK. If you’re traveling with your dog on a flight it might cost you $125. If you’re traveling with your dog on a cruise it could cost $1,000. The cost of taking your pet may be as much as your own ticket on the cruise. Find out what costs are involved in addition to the ticket. You may need to provide your own dog food. Once you’ve found the best cruise line for you and your dog, it’s important to do everything you can to make your dog comfortable with the experience. Traveling with your dog needs to be enjoyable. If your dog has never left your side and you’re about to put him into kennels on board ship, this may be stressful for your beloved dog. If your dog only sees you for part of the day, this could be a shock to him. In this case you’ll need to practice leaving your dog with a friend for awhile each day so he knows you can go away and come back again. Start with shorter times and build up to longer ones. Get your dog familiar with a dog crate which you’ll use to bring your pup on board and off again. Keep a favorite blanket or toy in the crate. These are the same tips for using a crate when flying so take a look at those tips above. You’ll also need a favorite blanket to leave in your dog’s kennel with him on board the ship. Regardless of what method you use to travel with your dog, watch for signs of anxiety or stress. If you see your dog with his head lowered but his eyes raised or his tail tucked between his legs, or he’s whining without ceasing, those are some common signs that he’s not happy or experiencing discomfort. You’ll need to give your dog the attention he needs and provide as much comfort and re-assurance as possible. This entry was posted in Comfort & Mobility on September 21, 2018 by Didi.